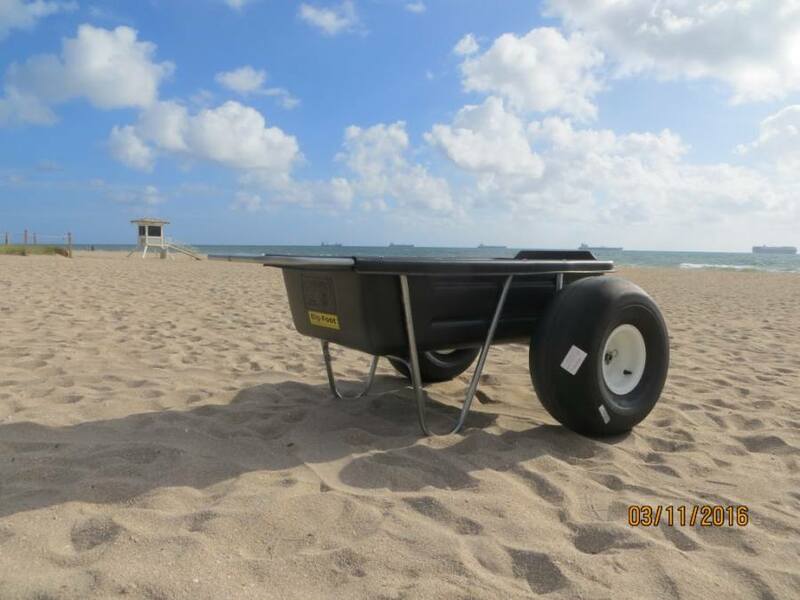 This is the ultimate beach cart on the market. Tired of carrying everything down to the beach, and then worse, having to carry it all back at the end of the day. Just load up the cooler, beach chairs, umbrella, boogie boards, towels, kids. Name it. Anything is possible with the biggest beach cart on the market today. It will handle anything you can throw into the polyurethane tub. You see the folks that just bought that really lousy dolly that works great in the store, but drags through the sand Lightweight with huge 21″ balloon tires to make moving across the sand as easy as having someone do it for you. Easy 300 lb. + capacity. Big grab handle and balanced well. Keeps the weight centred over the axle. Makes a great fishing cart for the surf fishermen that are sick of small tires digging into the sand. Wheels come off with quick release pins for easy transport. Works great as an all around yard cart as well. Will fit 2 bales of hay, in case you have a horse. Fits through a 4′ gate. Can be used to carry all kinds of stuff, cant damage the tub.